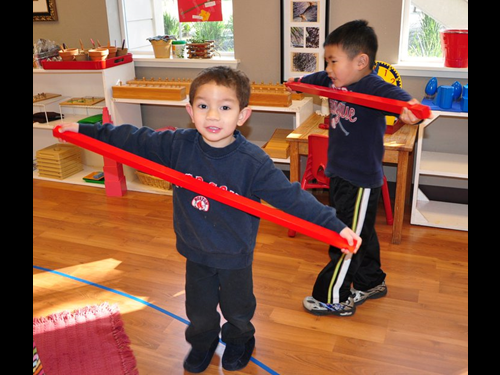 I chose a Montessori school for my son almost as an act of faith. At that time my knowledge of the method was zero; I had only heard of small chairs and colored beads. 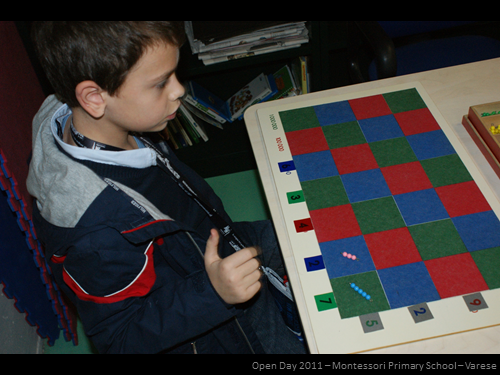 But seeing my son happy day after day encouraged me to make a thorough study of Montessori’s ideas. 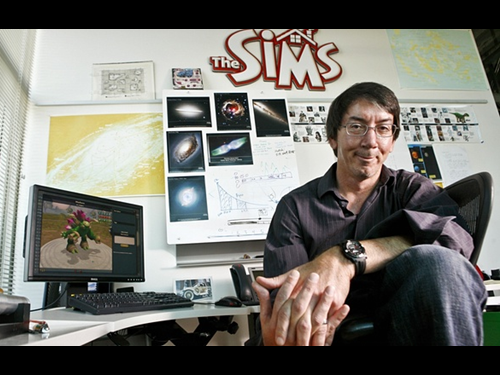 What I discovered astonished me both as a father and a scientist. As a father, I found that children are really respected and prepared for the future. 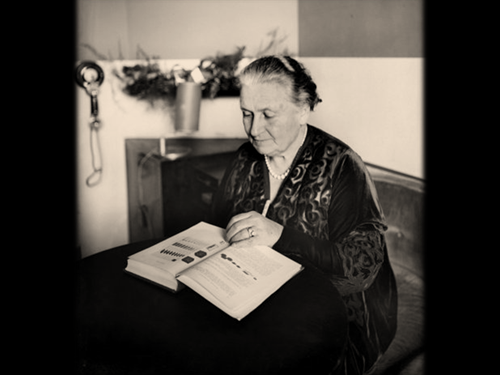 As a scientist, I found solid scientific foundations for everything Maria Montessori proposed. 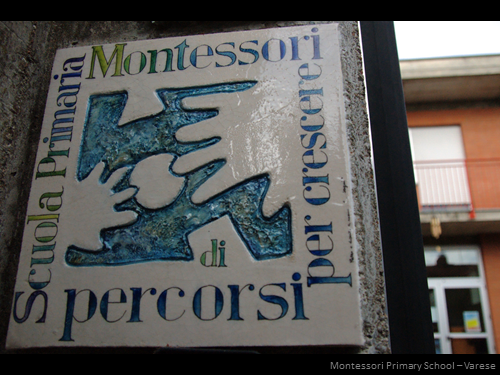 And now that my son has completed his Montessori experience, I would like to present concrete examples gathered during those years, hoping to convince other parents that their fears and concerns are unfounded and that sending their children to a Montessori school is the best present they can give them. With a huge thank you to Carolina Montessori for correcting my uncountable English blunders and for clarifying the words of her great-grandmother. Good morning and thanks for the invitation! 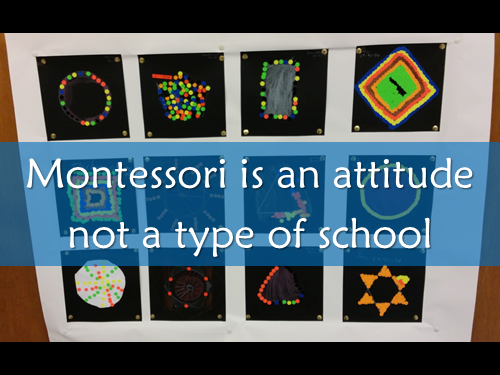 I’m a Montessori father and I’m here today to share with you the reasons why I sent my son to a Montessori school and why I’m convinced this has been the best present I have ever given him. 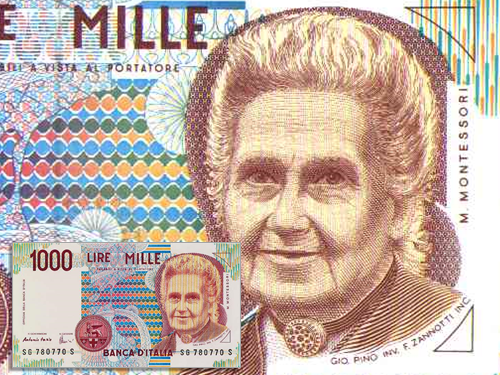 …practically all I knew about Maria Montessori was her image on the now obsolete Italian thousand lire banknote. 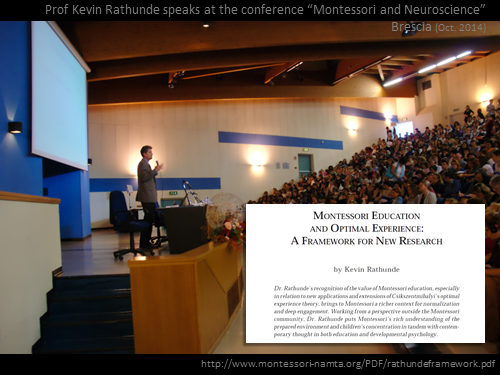 But before explaining how and why I moved from total ignorance to speaking here on Montessori's ideas, let me tell you a story. 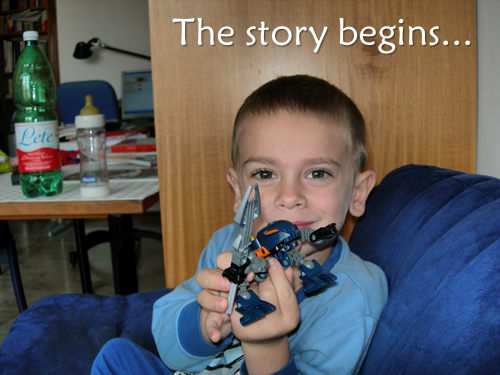 The story begins when my son Nicolò, almost 3 years old, had to be enrolled in kindergarten. 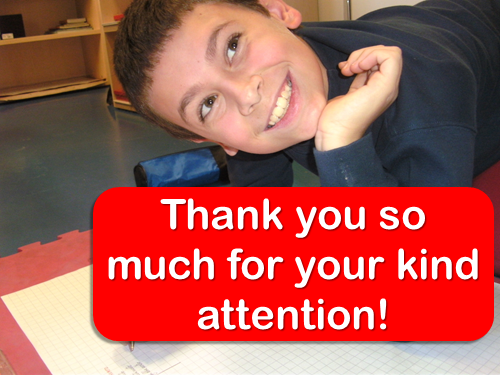 …after a few weeks, our son began to cry and didn’t want to go to school anymore. Worse, I saw his enthusiasm and energy diminishing day by day. At the beginning, we were convinced these were tantrums and thought: “He will change, he will get accustomed to the new environment…” and so on. Unfortunately, after a few months we discovered that his teacher was absolutely incapable of working with children, had literally destroyed my son’s self-esteem and, even worse, did not respect his needs as a child. After the umpteenth humiliation we took him out of the kindergarten, convinced that any other choice would be better than this. Soon we started searching for another school. At this point we were not interested at all in the pedagogical method. We wanted a school in which our son would be respected as a person. 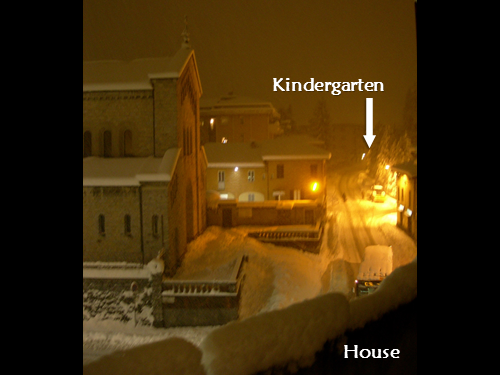 One day my wife said: “I heard there is a Montessori school ten kilometers from our home. I remember from my studies (she is a teacher) that respect for the child is the first and foremost principle.” OK, let’s go and see. 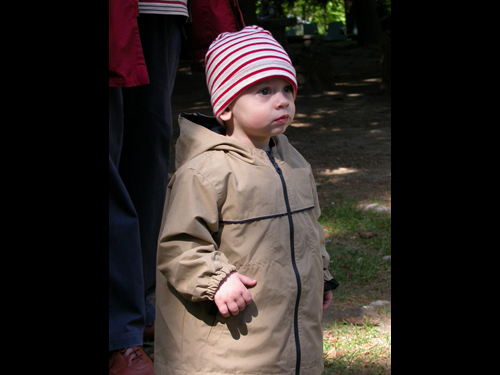 We were so amazed by what we saw: the order, the smiling children, the silence… that we instantly decided to enroll Nicolò there. 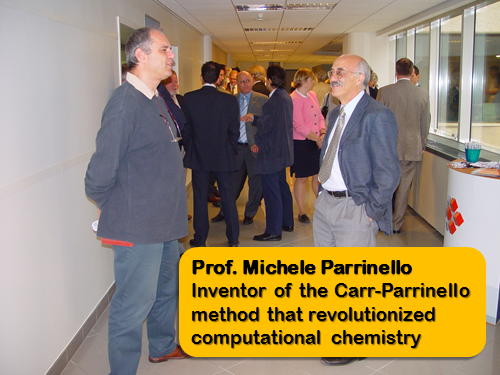 … Nicolò began to flourish! We regained the child we used to know. …And we heard the same stories from the parents of his classmates. 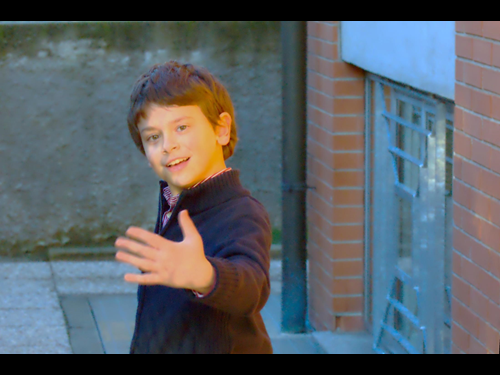 …Nicolò was happy to go to school, learned a lot and, most importantly, regained his self-confidence. 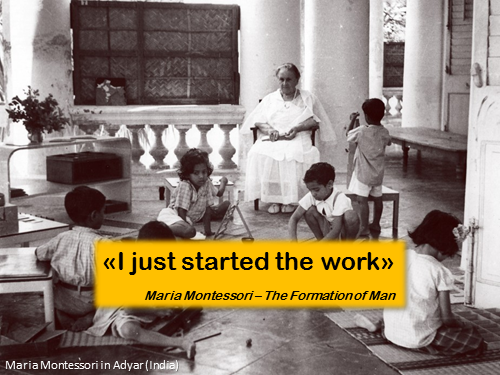 (He asked me to include this slide: “Here is the happy face of every Montessori student.” It is so very true). Well, I could just stop here. 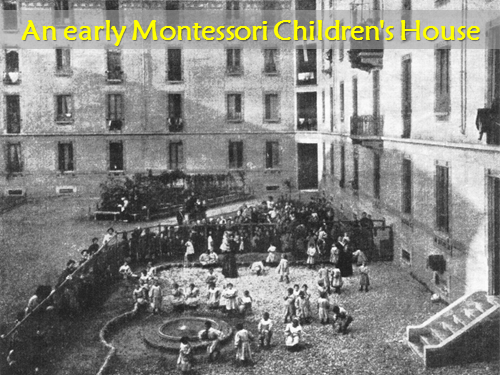 The story I presented, and many other similar stories, should convince you that Montessori is the best present you can give your sons and daughters and that you can trust Montessori, even if you don’t understand exactly what it is all about. 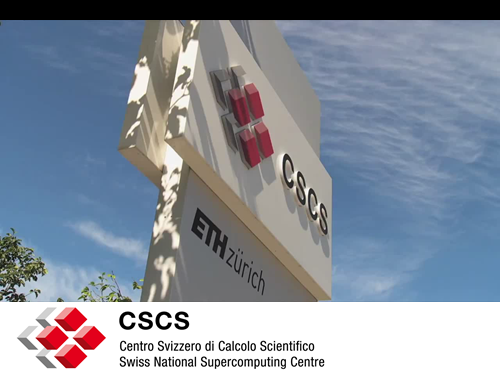 … And at CSCS I work very often with renowned scientists. 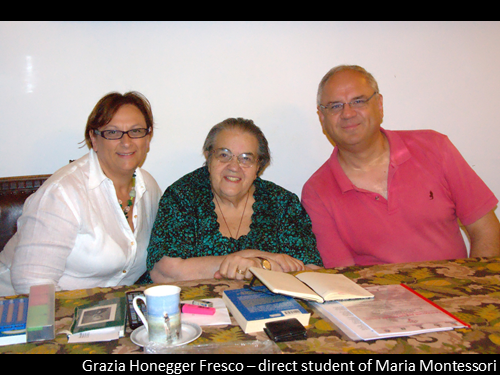 … Grazia Honegger Fresco, who, as I soon discovered, is one of the last living students of Maria Montessori. 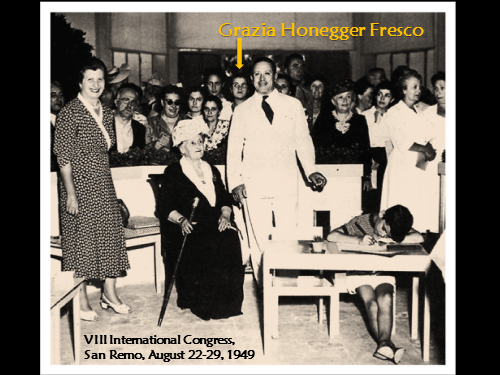 Here is a photo of Grazia at age twenty attending the Montessori International Congress in 1949. Apart from Grazia, I have had the honor to meet wonderful women who studied under a direct student of Maria Montessori: Luana Gigliarelli and the other teachers in Perugia studied under Maria Antonietta Paolini, Donatella Pecori was a student of Flaminia Guidi, while Costanza Buttafava was trained by Giuliana Sorge. 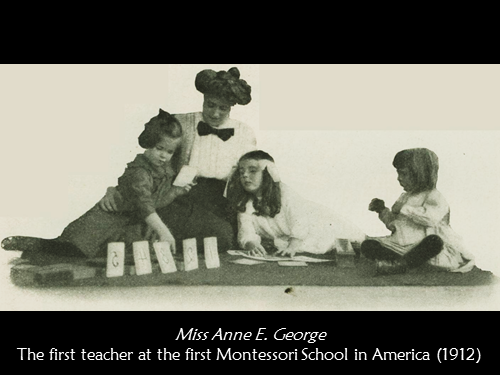 Extraordinary people who have shown me, without words but by how they lived, what it means to have absorbed Montessori’s spirit and ideas. 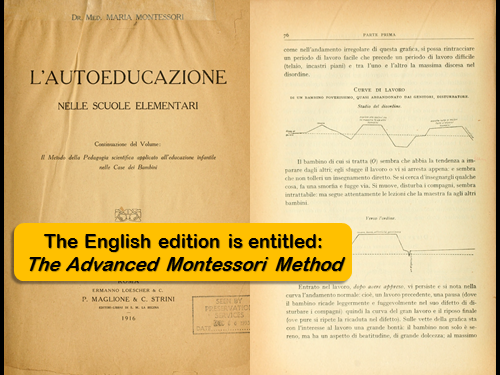 Unfortunately, I have also met teachers who have Montessori only on their diploma. Poor children! By the way, Grazia herself suggested the title for this presentation. 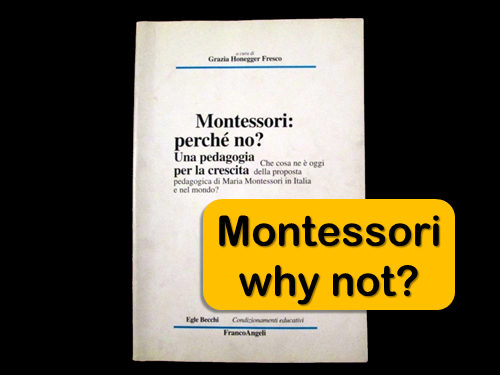 She has written a book entitled “Montessori: perché no?” [Montessori: why not? ], full of interesting documents and testimonies. 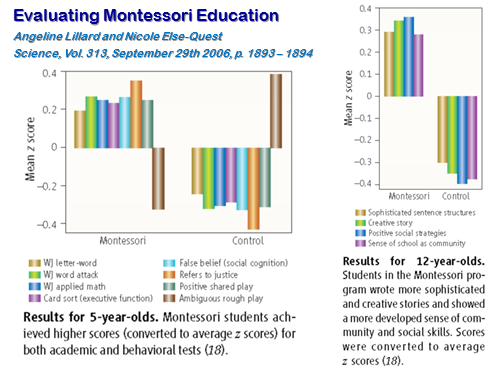 Now that you have heard my story with its “happy ending”, I would like to share with you the results of my scientific investigations, which have convinced me that Montessori is the best educational idea ever. 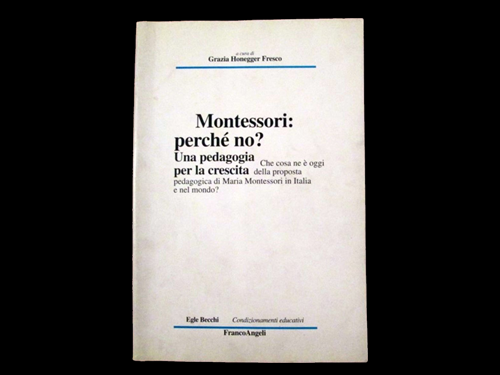 … or Donatella Pecori in Italy who has studied normalization using high speed cameras, producing impressive charts that confirm exactly what Montessori wrote in her books in the language of the early 20th century. 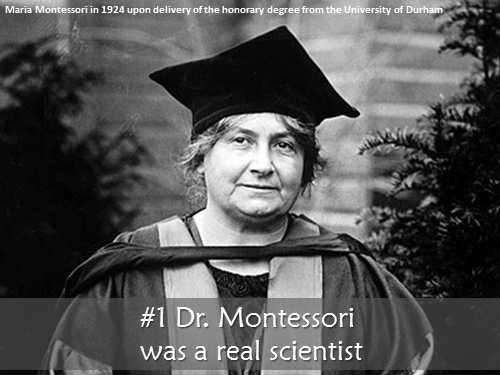 What really convinced me as a scientist was the perfect match between Montessori's ideas and the function of the brain. 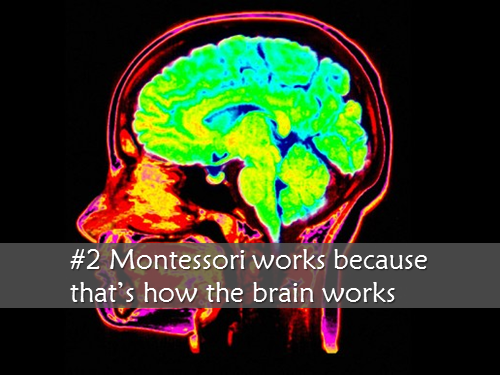 Yes, “Montessori works because that’s how the brain works” is a strong reason to choose Montessori education. Now I want to show you just a few examples of this correlation, because an entire lecture is not sufficient to cover everything. 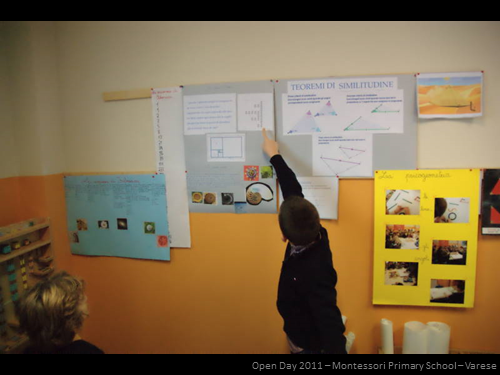 … Here the boy dressed in yellow is actually working and learning merely by watching other children work. 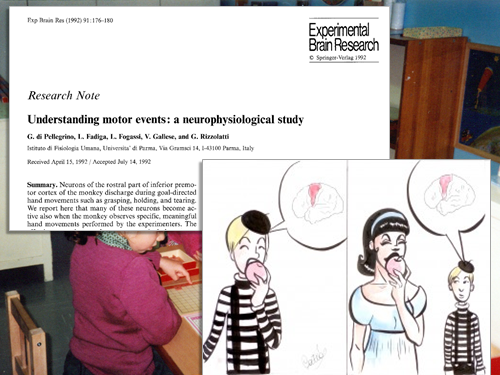 When a teacher presents a material, she breaks the action down and shows one step at the time slowly and precisely (which Montessori calls analysis of movement), to facilitate the work of mirror neurons to capture and acquire a new movement. 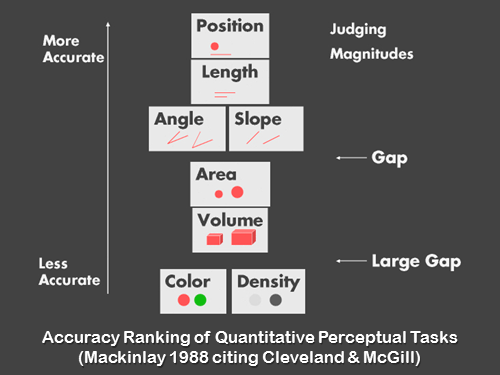 … there is a hierarchy in our perceptual system in acquiring quantitative measures. And length is one of the most accurate. Volume, that is the weight that you perceive when carrying the rod with only one hand, is much less accurate. 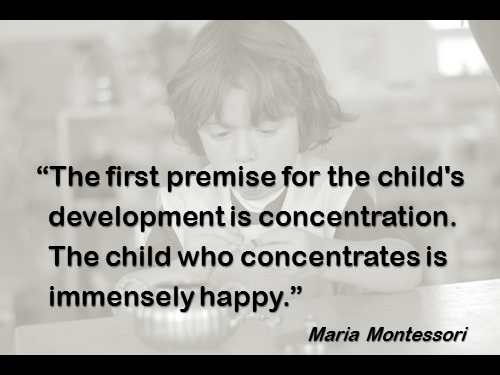 For me this is another very true insight of Maria Montessori. 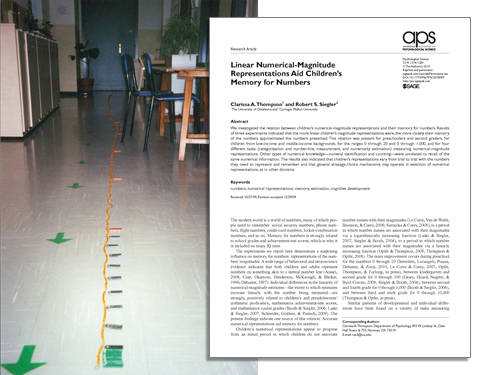 … Children putting labels on the “thousand chain” exactly in reverse order with respect to the mental line: more concentrated at the beginning, less at the end. 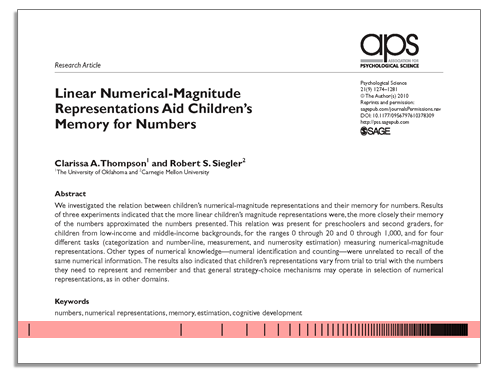 In a certain sense this compensates for the differences in the density of the numbers, making the mental line more uniform. Is it just a coincidence? I don’t think so. 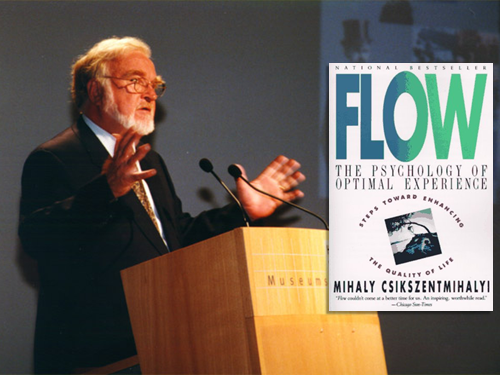 The same results were found a few years ago by Professor Mihály Csíkszentmihályi who studied this condition of deep concentration, which he calls “flow”, as well as the conditions needed to enter flow and the results and benefits. 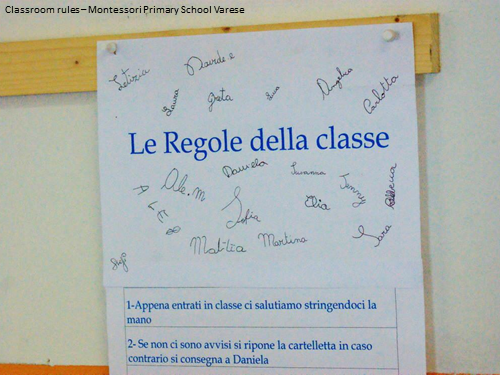 Recently, one of Csíkszentmihályi's students began to study flow in Montessori schools and has written some very interesting articles. 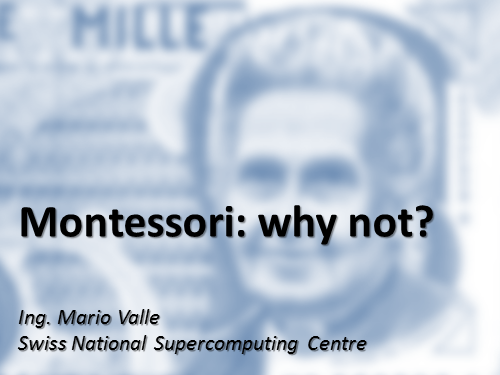 Apart from the content of the article I am referring to, I found two interesting statements: first, he says that he does not belong to the Montessori community, so his conclusions are not influenced by preconceived ideas (every scientist should do this). 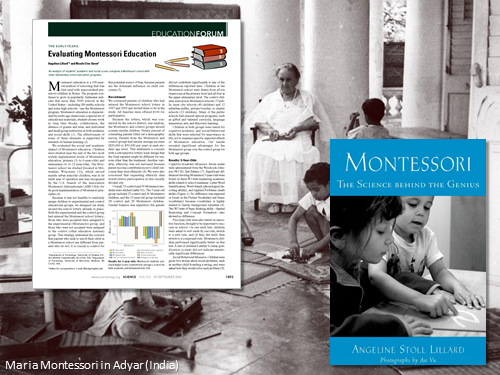 Second, he states that Montessori's ideas on concentration deserve to be studied much deeper because it is a hot topic in current psychological research. Interesting, but what are the conditions to enter into flow? In the first place, you need clear rules. And what do you find in a Montessori school? Clear rules! In the second place, you need immediate and clear feedback on where you are in a chosen job. And this is exactly what the material provides. 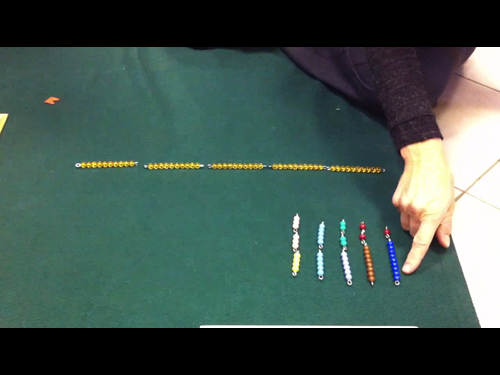 For example, when stringing beads the length of the string is exactly what is needed for the task: the child can see at a glance where he is in his work. But the most important condition to enter into flow is that the challenge, the difficulty of the task (the red dots), should be equal to or just a little above the person’s skills. 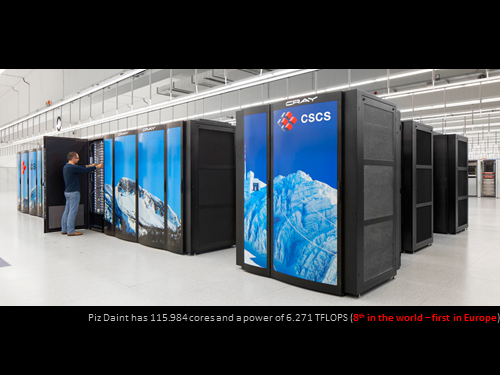 …if the task is too simple it is boring (1). 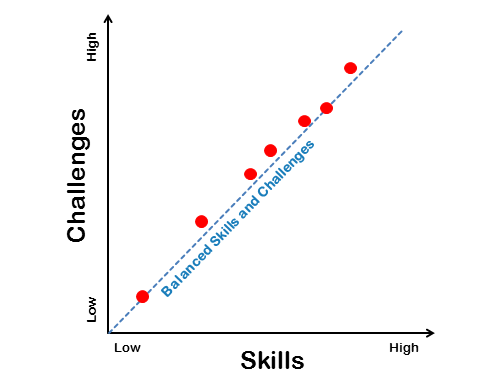 If it is too complex with regard to the person’s skills, it generates anxiety (2). 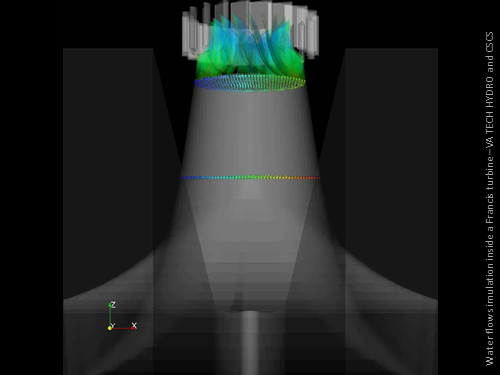 The correct balance however induces flow (3). 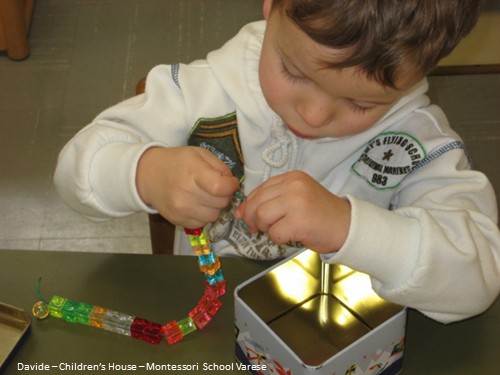 And what happens in a Montessori school? The teacher suggests an activity, sees it is too simple because the child is getting bored, so she proposes another one that is a bit too complex. 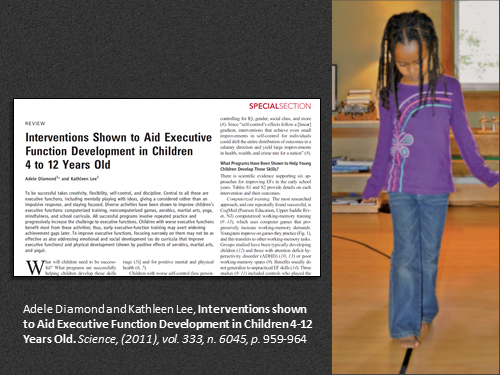 Finally, she suggests another activity that corresponds to the child's interests and skills. 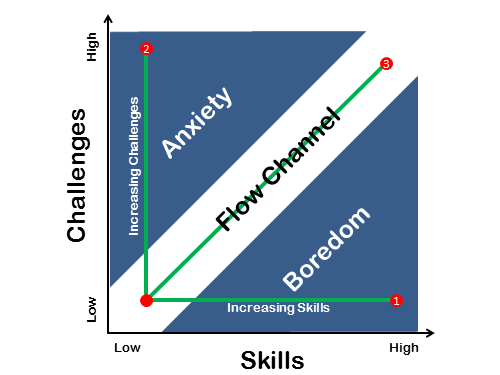 He can now concentrate on this activity and enter the flow channel and thus become “immensely happy”. How does the teacher arrive at this result? 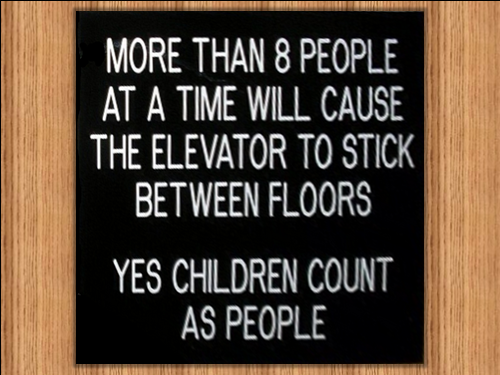 By carefully observing each child. 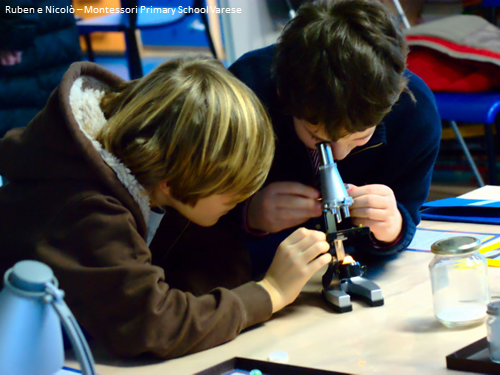 Here the teacher acts as a scientist, testing out hypotheses about what kind of assistance might be most helpful to this particular child or if he is ready for new challenges. It is not easy to do. It takes training to become a scientist. Another example is provided by the Executive Functions. These are a set of mental functions that help us manage new and unexpected situations. 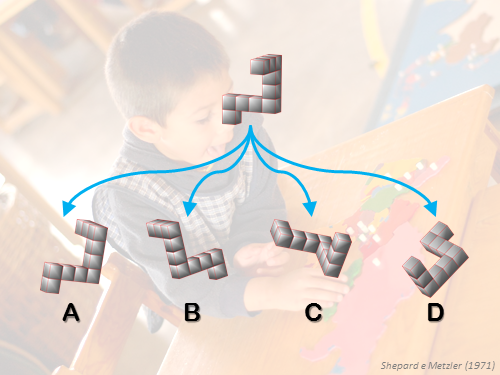 The most important functions are: self-control, working memory, cognitive flexibility, plus other, more complex ones: planning, reasoning, problem-solving. 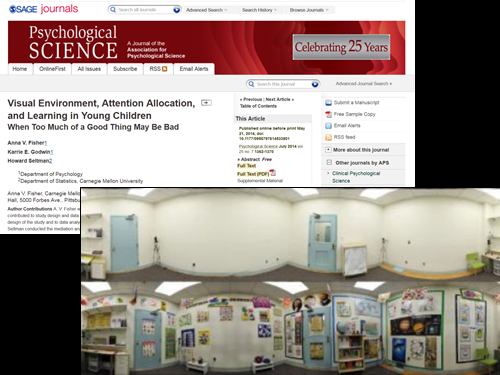 Adele Diamond, a renowned neuroscientist, has published a study in Science comparing various educational methods in terms of how they help the development of Executive Functions. 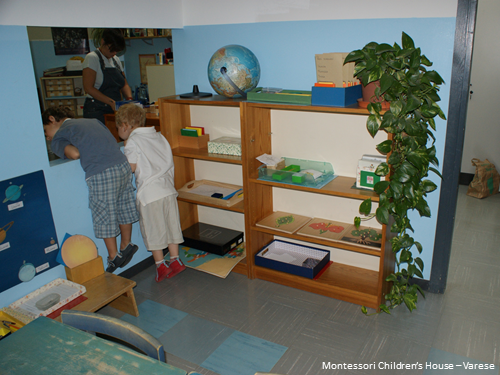 Needless to say, Montessori comes through with flying colors because it provides many activities especially targeted to the development of Executive Functions. 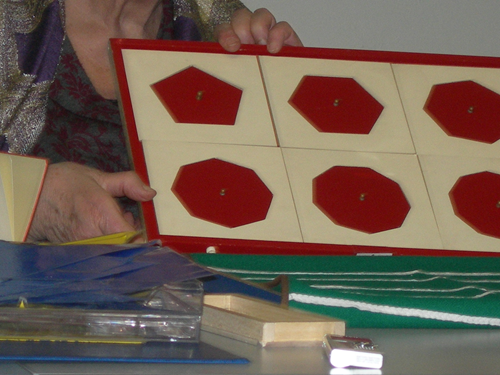 For example: the limitation of materials, the silence game, walking on the line, math activities, memory games, all practical life exercises, and many, many more. 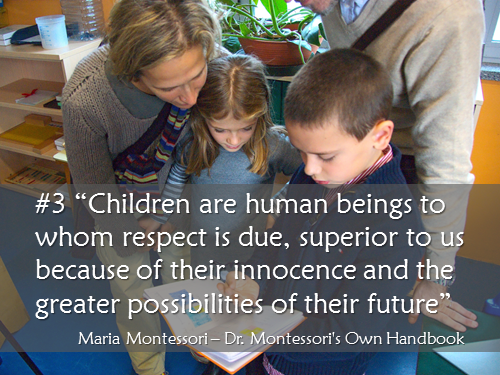 … In the words of Maria Montessori: “Children are human beings to whom respect is due, superior to us by reason of their innocence and the greater possibilities of their future.” This respect comes before the materials, before the school routine, before the presentations. It is respecting the pace of the child, his aspirations and desires by guiding, not drilling, him. 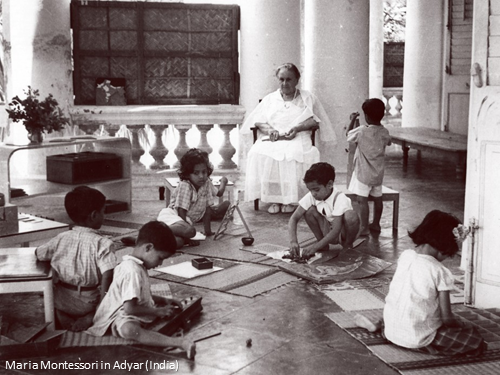 This is the reason why Montessori’s ideas are more relevant than the techniques. …Some of these I have collected and, with the help of Grazia Honegger Fresco, I have tried to answer them. You can find this collection on my website in Italian and English. But here I will try to cover the most popular ones. 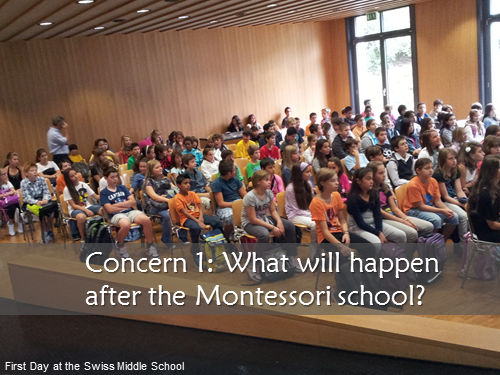 First concern: What will happen after the Montessori school? 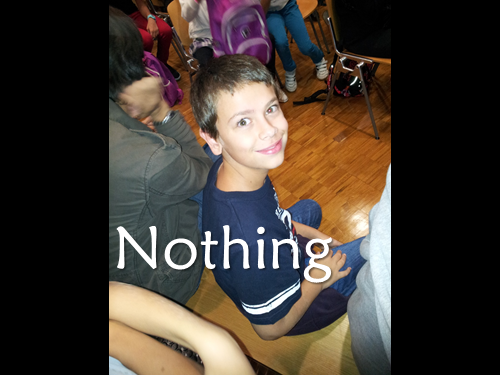 My son actually profited the first two years in secondary school from the preparation given him by the Montessori school. 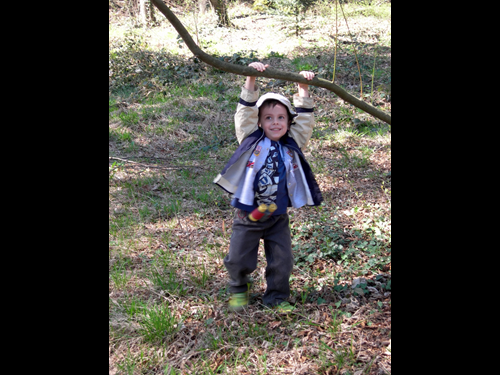 Nothing happens, because the children have been guided to exercise responsible free choice since early childhood and so they are stronger and more aware of their environment. They have acquired a sense of responsibility in the way they work and interact with others, the ability to control themselves, to reason and cooperate. 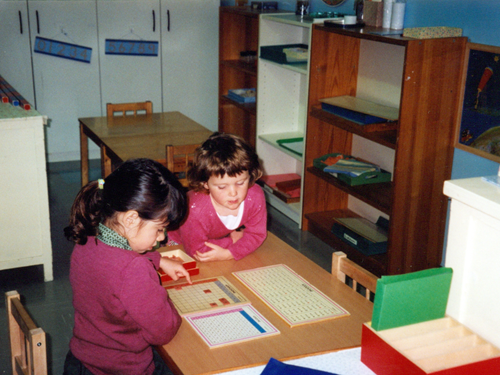 Moreover, in the last year of primary Montessori school the teachers try to prepare the children to cope with the new, different environment that awaits them: the system of grades, competitions, tests and especially the absence of choice. 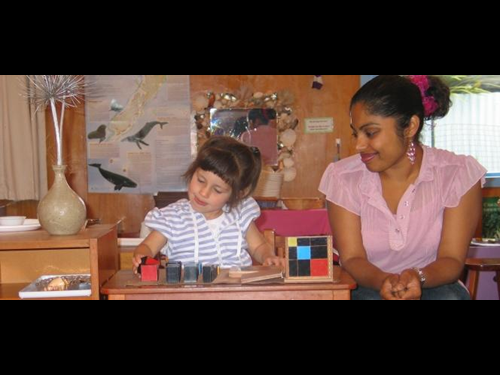 To achieve this, it is essential in a Montessori school to strengthen the children, making them live in a non-anxiety-provoking, non-judgmental and non-competitive environment at least in the early years. 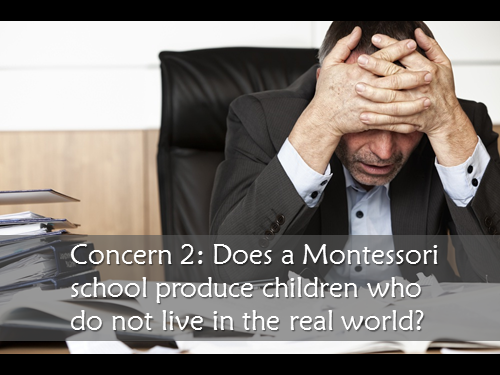 Second concern: Does a Montessori school produce children who do not live in the real world? And related to this the following “brilliant” idea: I think children need the competitiveness and frustrations they will find in the world that awaits them. 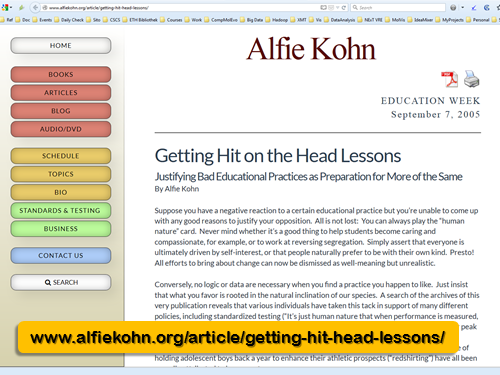 …the article by Alfie Kohn entitled: “Getting Hit on the Head Lessons”. 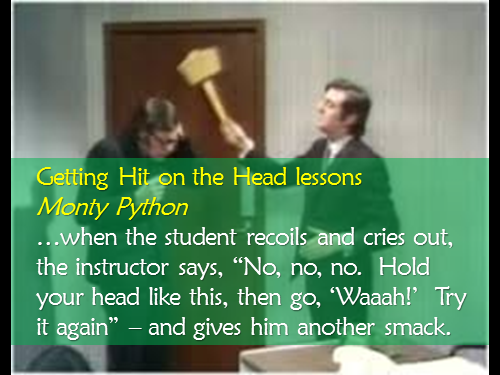 The title comes from an old Monty Python sketch in which the teacher hits the student's head with a big hammer. When the student recoils and cries out, the instructor says: “No, no, no. Hold your head like this, then go, ‘Waaah!’ Let's try again.” — and gives him another smack. This is exactly what people do who ask for more frustration at school! The theme of the article was precisely this: politicians and planners justify bad educational practices as a preparation for more of the same. 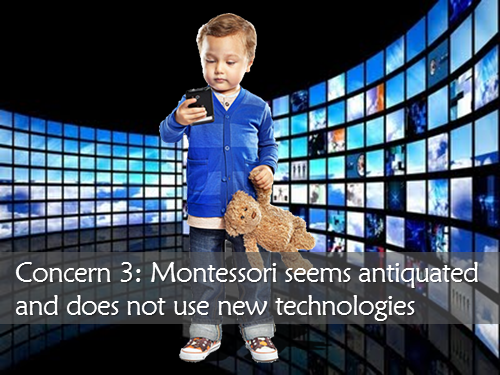 Another concern: Montessori is antiquated and does not use new technologies. Its materials are not abreast of the times, they are old and do not evolve. Before answering this concern, ask yourself the real, fundamental question: what do we want our children to become? 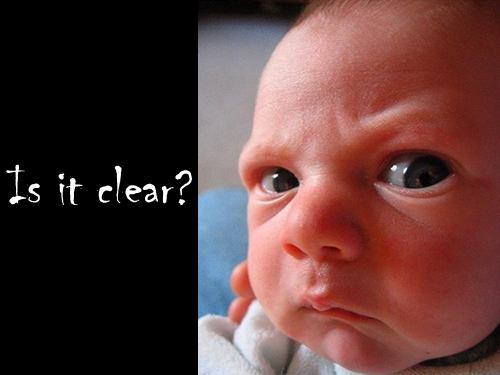 Do we want button-pushers who use technology, but don’t understand it? 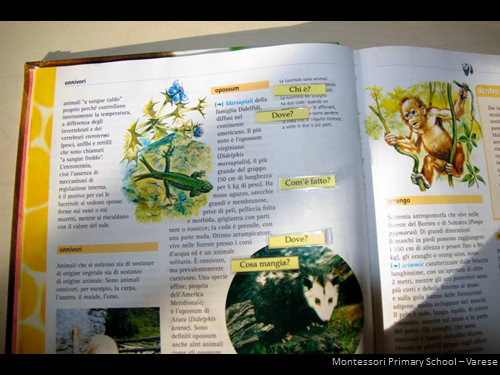 Moreover you should realize that a tablet in the classroom does not make a school digital. 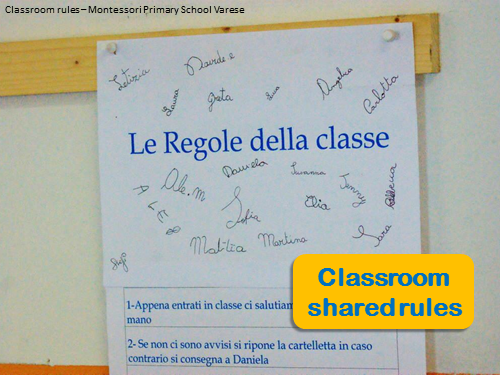 An interactive whiteboard in a classroom does not make a school modern when it is only used for traditional lessons. Do you realize that the developers of the latest smartphone applications use paper, pens and Post-it to design them? It’s not the technology that makes a school modern, but the ideas and principles the school embodies. 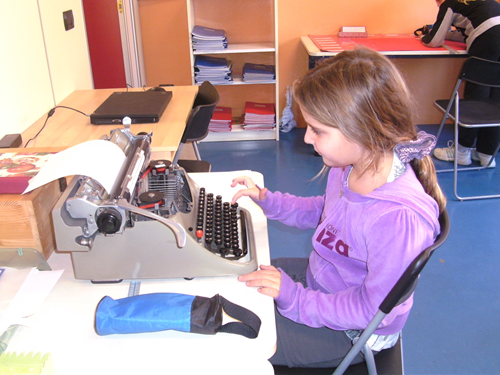 For example, at my son’s school there was a computer, but the children queued up to use this old mechanical typewriter. Why? Maybe because they can see what happens, when they push a key. Again it is not technology that matters, but what satisfies their curiosity. My colleague John has never seen an actual Francis turbine like this one. Yet he had to imagine it and manipulate it in his mind to find the best way to represent the movement of water in order to help the scientists understand where and how vortexes are formed in the turbine’s drain conduit. 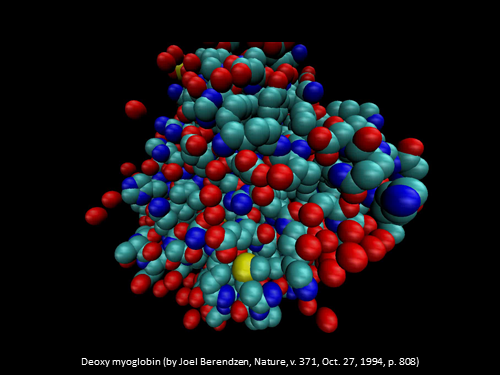 In my visualization of chemical data I can only manipulate representations of molecules behind a glass screen, the monitor of my computer. It is obvious that I still need to be able to handle these objects and models in my mind in order to obtain effective manipulations. In both cases we are able to manipulate objects in the mind if we are able to manipulate physical objects in a real environment. 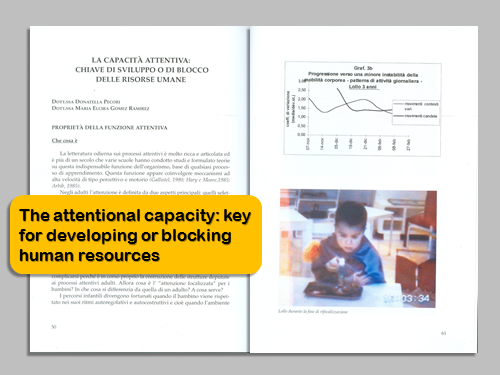 And what could be better for acquiring this capacity than the “puzzle maps” in a Montessori school? And there is a reason why this works. 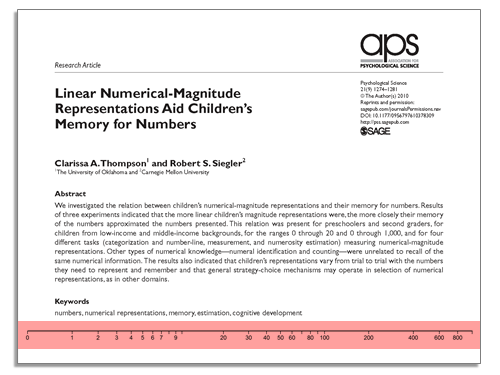 The famous psychological test by Shepard and Metzler shows that we rotate mental representations as if they were physical objects. How did they reach this understanding? The test consists of finding which item at the bottom row corresponds to the one at the top. The time it takes to determine which two objects match is proportional to the angle that exists between them. That is, we rotate in the brain one object to match the other as if they were physical objects. (In the problem shown here, the object at the top corresponds to object B). 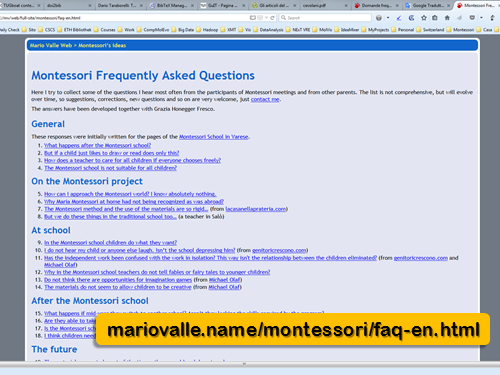 Very simple technology, but the child learns how to formulate the right questions. As we all know, today it is simpler to obtain answers than to pose interesting questions. 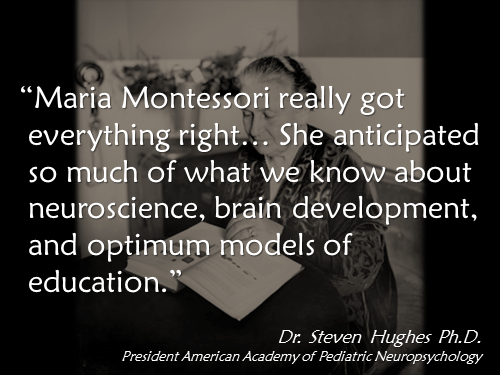 This is another example that shows how Montessori schools prepare children for the future by focusing on skills that really matter. 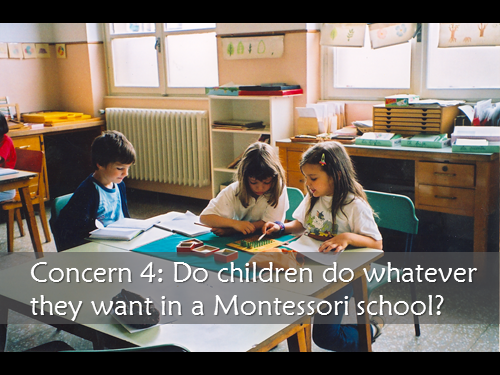 Another concern: Do children do whatever they want in a Montessori school? 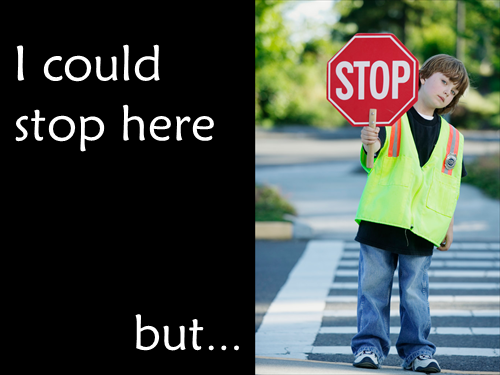 Let's be clear: the willingness of the child to be active and to work hard is closely related to the possibility of choosing freely from the many things on display in the environment, without the adult telling him what to do. 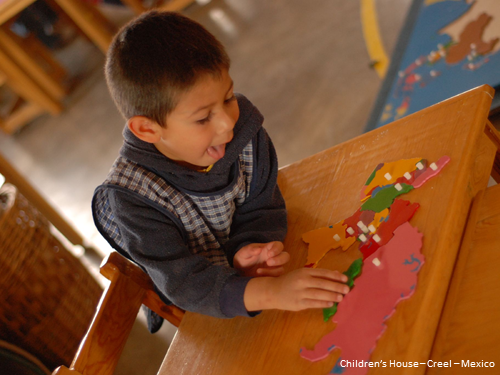 In addition, along with free choice, the child also takes responsibility for the use of the materials. These should be handled with care, they should be put back in the right place when the child has finished his work and should be used appropriately. Few rules, but rigorously followed in a responsible way. This responsibility is not just the “do what I want” in the usual, ambiguous and arrogant sense of the phrase. 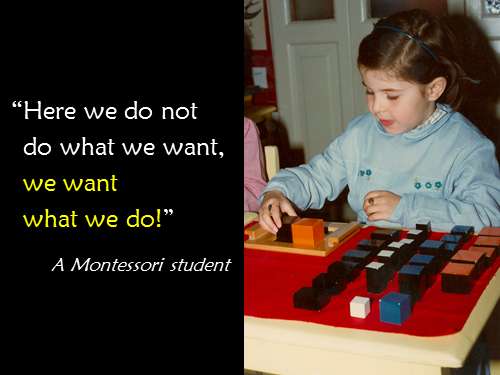 A Montessori student once said: “Here we do not do what we want, we want what we do!” A nice and clear summary. First of all, observe. Go to a Montessori school and see what they do, just as these mothers did from the garden fence of one of the early Montessori Children’s House. Ask if you may visit the school and observe, without disturbing or speaking. 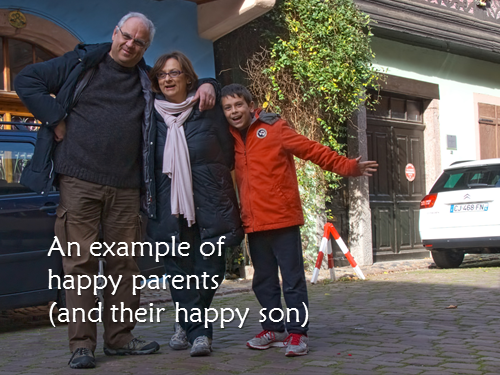 Exchange experiences with other parents. 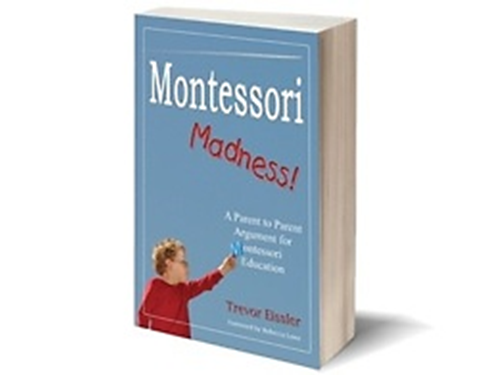 I found it very interesting to read this book that relates the experience of a father who, after various problems, ended up by finding a Montessori school. 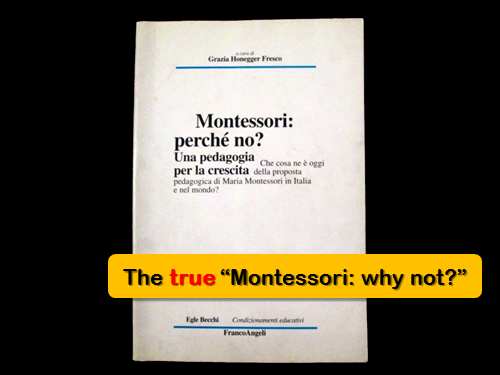 On the internet you can find a short movie based on the book which presents Montessori's main ideas. 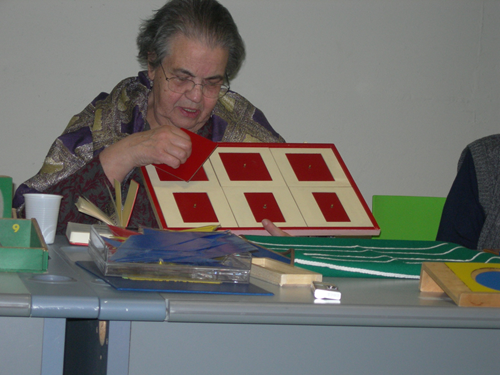 Go to the presentations of the materials or various aspects of Montessori organized for parents. 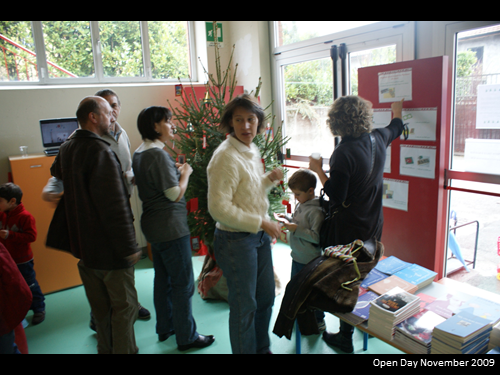 In Brescia (Italy) the local association has even organized a “School for Parents”. 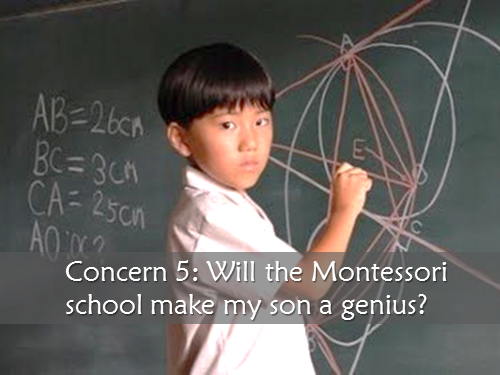 If you decide to enroll your child in a Montessori school, discreetly find out if the teachers are capable, just as the Secret Service does when you apply for a classified position! Your child is much more valuable than a “Top Secret” dossier. 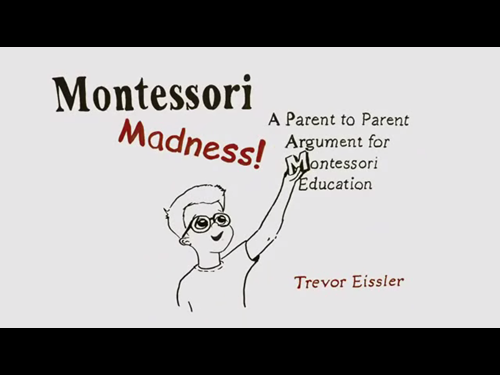 If the teachers have not absorbed Montessori, they could wreak havoc on your child's development. I don’t speak of technical experience, I speak of their ability to put the child at the center. And, last but not least, the atmosphere at home. 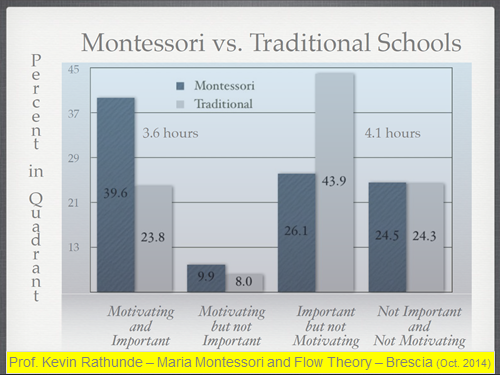 If the child is not respected at home as he is at school, half of the advantages of a Montessori education vanish. I’m not speaking of big issues or shameful situations. It's about cutting the meat on your child’s plate when he wants to do it himself just as he does at school. 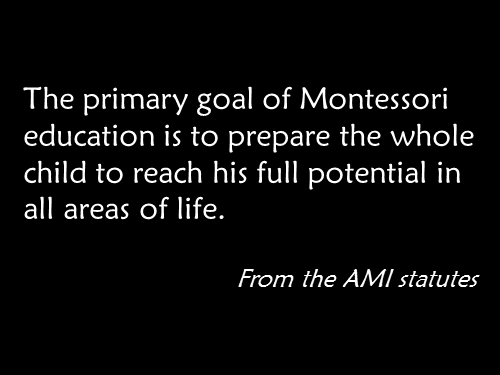 As I said before, “Montessori is an attitude, not a type of school.” Because it is “simply” revolutionizing the relationship between adult and child. Nothing less. And good, well prepared teachers will help and guide this revolution with the cooperation of you, the parents. 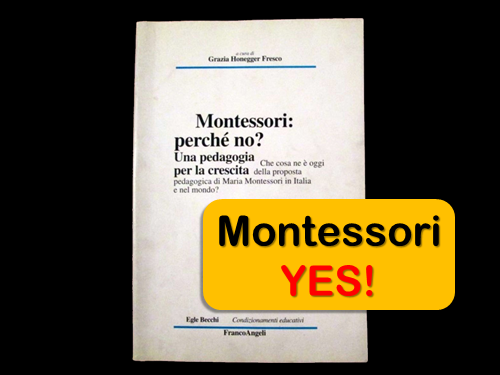 …resounding “Montessori: yes!” Because this is the best present you can give to your sons and daughters. And to yourself.